Sturdy all-welded steel with durable powder coat finish stands up to heavy use. Capacity is 1,200 lbs. Roomy shelves help move more product. Choose flush top for easier handling of large boxes and bulky items; choose lip top for retention of small parts. Elevated writing surface keeps your pick list in sight but out of the way, so you can pick with both hands. Two rigid and two swivel casters promote steady yet responsive steering. 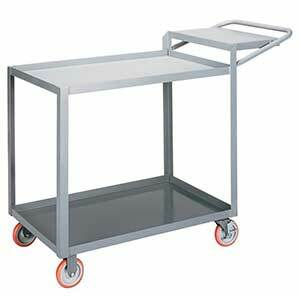 Wheel brakes stabilize the cart during loading and unloading. Optional storage pocket or lockable drawer holds personal items, writing implements, and supplies separate from picked product. 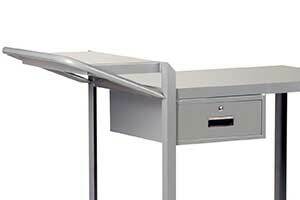 Locking drawer provides secure storage for sensitive documents or small valuables. 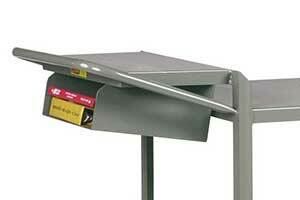 13"W x 17"D x 4.5"H drawer reduces lower shelf clearance from 25" to 20.5"